Prayer is a central aspect of religion. Even amongst those who have abandoned organized religion levels of prayer remain high. Yet the most basic questions remain unaddressed: What exactly is prayer? How does it vary? Why do people pray and in what situations and settings? Does prayer imply a god, and if so, what sort? 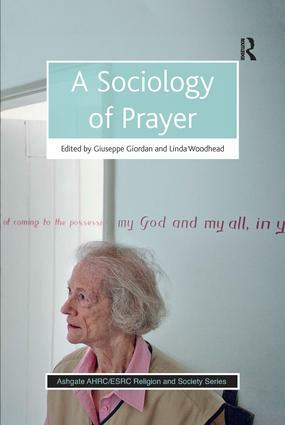 A Sociology of Prayer addresses these fundamental questions and opens up important new debates. Drawing from religion, sociology of religion, anthropology, and historical perspectives, the contributors focus on prayer as a social as well as a personal matter and situate prayer in the conditions of complex late modern societies worldwide. Presenting fresh empirical data in relation to original theorising, the volume also examines the material aspects of prayer, including the objects, bodies, symbols, and spaces with which it may be integrally connected. Contents: Introduction: You never know. Prayer as enchantment, Giuseppe Giordan; Prayer as practice: an interpretative proposal, Carlo Genova; For youth, prayer is relationship, Michael C. Mason; Pentecostal prayer as personal communication and invisible institutional work, Yannick Fer; Transcendence and immanence in public and private prayer, Martin Stringer; Prayer as a tool in Swedish Pentecostalism, Emir Mahieddin; Contrasting regimes of Sufi prayer and emotion work in the Indonesian Islamic revival, Julia Day Howell; A socio-anthropological analysis of forms of prayer among the Amish, Andrea Borella; Filipino Catholic students and prayer as conversation with God, Jayeel Serrano Cornelio; The embodiment of prayer in charismatic Christianity, Michael Wilkinson and Peter Althouse; Prayer requests in an English cathedral, and a new analytic framework for intercessory prayer, Tania ap SiÃ´n; An analysis of hospital chapel prayer requests, Peter Collins; Conclusion: Prayer as changing the subject, Linda Woodhead; Index. Giuseppe Giordan is Associate Professor of Sociology of Religion at the University of Padua (Italy). He is Co-Editor of the Annual Review of the Sociology of Religion (Brill), elected member of the Executive Council of the Association for the Sociology of Religion, and served as General Secretary of the International Society for the Sociology of Religion from 2009 to 2013. His books include Identity and Pluralism. The Values of the Post-Modern Time. New York: Center for Migration Studies, 2004; Vocation and Social Context (ed. ), Leiden: Brill, 2007; Conversion in the Age of Pluralism (ed. ), Leiden: Brill, 2009; Youth and Religion, Annual Review of the Sociology of Religion (ed. ), 1, Leiden Brill, 2010; Religion, Spirituality and Everyday Practices (ed. with William H. Swatos, Jr.) New York: Springer, 2011. Linda Woodhead is Professor of Sociology of Religion at Lancaster University, and Director of the Â£12m AHRC/ESRC Research Programme on Religion and Society. Her books include Religion and Change in Modern Britain, ed. with Rebecca Catto, London: Routledge, 2012; A Sociology of Religious Emotion, with Ole Riis, Oxford: OUP, 2010; The Spiritual Revolution: Why Religion is Giving Way to Spirituality, with Paul Heelas, Blackwell, 2005; An Introduction to Christianity, Cambridge University Press, 2004. Edited and co-edited books include Religions in the Modern World 2nd edition, London: Routledge, 2009; Congregational Studies in the UK, Aldershot: Ashgate, 2004; Predicting Religion: Christian, Secular and Alternative Futures, Aldershot: Ashgate, 2003; Peter Berger and the Study of Religion, London: Routledge, 2002; Reinventing Christianity: Nineteenth Century Contexts, Aldershot: Ashgate, 2001; Religion in Modern Times, Oxford: Blackwell.